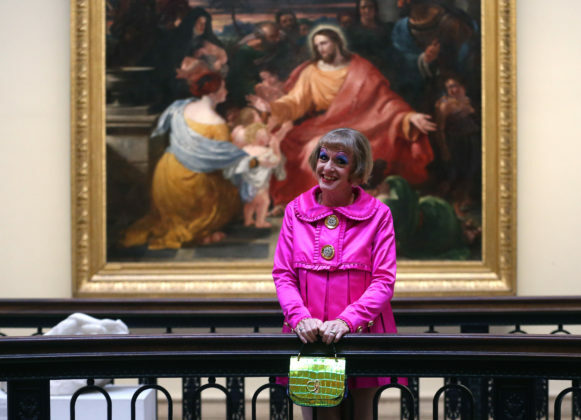 Dresses belonging to the artist Grayson Perry will be exhibited at Liverpool’s Walker Art Gallery in the first display of its kind to be held in the UK. Making Himself Claire: Grayson Perry’s Dresses runs from 4 November 2017 to 4 February 2018 and will showcase 12 dresses, including the Bo Peep dress worn by Perry when he won the Turner Prize in 2003. Essex-born Perry calls his transvestite alter ego Claire and considers 5 November 1975 to be Claire’s birthday. While he didn’t adopt the name until later, when he began to visit transvestite clubs, it was on this date that, aged fifteen, he first walked around his local village wearing a chiffon headscarf over an auburn wig, a brown polyester blouse and a dog-tooth checked skirt, black court shoes and a beige mac. Perry has described Claire’s earliest manifestations as a conventional ‘Essex housewife’ or ‘newsreader’ type. Later, finding being able to ‘pass’ as a woman no longer rewarding, he developed more flamboyant outward expressions for Claire, tapping into aspects of femininity that he had reached out for since childhood. Pauline Rushton, Senior Curator of Decorative Arts at National Museums Liverpool, said: “Visitors who enjoyed Grayson Parry’s touring exhibition The Vanity of Small Differences at the Walker in 2014 will be familiar with the artist’s ability to explore complex social issues in a relatable, witty and engaging way. In his own work, Perry works with traditional media such as ceramics, cast iron, bronze, printmaking and tapestry. He uses their seductive qualities to make stealthy comments about society, including its pleasure, injustices and flaws, and to explore a variety of historical and contemporary themes. Grayson Perry at Liverpool Walker Art Gallery.